Ascending Butterfly: Win a set of 6 Custom Notecards from Pretty & Personal Papers! Win a set of 6 Custom Notecards from Pretty & Personal Papers! This giveaway is now CLOSED. The winner is Peggy Gorman, Congratulations Peggy! Thanks again to our friends at Pretty & Personal Papers, we look forward to working with you again! Today's words of inspiration often times remind us about gratitude. This being right after the holidays, you may need to send out special notes of Thanks for all those lovely holiday gifts you received this year. I like to send out New Years notes to family and friends as well, thanking them for being a big part of what made the year that is ending special and sharing New Year's wishes for the year to come! I am a stationery addict. I'm sure it stems from having penpals since elementary school. I can't pass a stationery store without going inside. I also love stickers, seals and stampers for this reason! Finding 'just the right' paper, cards and stationery is sometimes an art, and when you can't find it, you sometimes consider going custom, that is, until you see the prices of custom orders! Thankfully there is someone out there who loves paper as much as I do. Not only does she love paper, she is incredibly creative and is the tour-de-force behind Pretty & Personal Papers, Tricia Richner! You can find Personalized Greeting Cards, Mommy & Custom Journals as well as Individually designed and hand made monogrammed note cards, special occasion greeting cards and even Home Decor at this welcoming Etsy shop! Custom cards with amazingly affordable pricing, fast turnaround & delivery and excellent customer service. 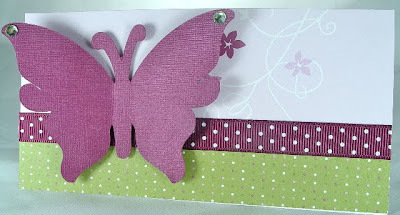 I was very impressed with the custom sample notecard I received from Pretty & Personal Papers, it incorporated my favorite color combo, and pattern with of course, a butterfly! Tricia has put together an amazing giveaway for us, and I just can't wait to share. WIN IT! - Ascending Butterfly and our friends at Pretty & Personal Papers, wants to help you send out your next Thank You, Birthday, or New Year's Wish in style! One lucky 'Ascending Butterfly' will have the chance to win a set of 6 custom designed Butterfly Note Cards! These notecards as pictured above, were especially designed for this giveaway! How to Win: (1) You must be a follower of Ascending Butterfly to be eligible for this and all giveaways. Indicate in your entry that you follow (if your 'comment name/user id' differ from your profile id, please let me know what name you follow under) and (2) Visit Pretty & Personal Papers and select another item at her shop you like, post the LINK to that item in your entry. (3) You must also leave your email address somewhere in your comment. (You can format it this way for security, example: ascendingbutterfly AT mail host DOT com). Please follow the easy 1, 2, 3 steps to winning! This giveaway is open to USA residents who are 18 years of age or older. I like the wire bound journal. This is great Tricia has beautiful stuff. I love the Monogramed Initial Note Cards or Invitation in "Darling Doodles" pattern. So sweet!! I like this set of monogramed note cards. They are adorable! I like the Monogrammed Initial Note Cards or Invitations in "Razzleberry Lemonade" pattern. These are the cutest ideas. I love all her products, This is a perfect reason why I desire a Cricut machine. I want to do these myself! but in the mean time I will try to win some from others. I am following her blog publicly now. Thankful I did, cause that is how I learned about this giveaway. I follow your blog. I love the Tall Tales Monogrammed Note Cards! I follow Tricia of Pretty & Personal Paper's Facebook fan page.